The Lower Modernisms – 054. Lomo Featured Projects: Carson Plaza and Circus Do-nuts. Lomo Field Trip: Carson Street, Torrance. October 12, 2013 by James Black. One sunny morning in July, I took a lomo field trip down to Carson Street in Torrance, where a couple of projects had caught my eye previously on a quick drive-by. On route via Crenshaw Boulevard, I passed a couple of minor landmarks from the 1960s fast-food boom. 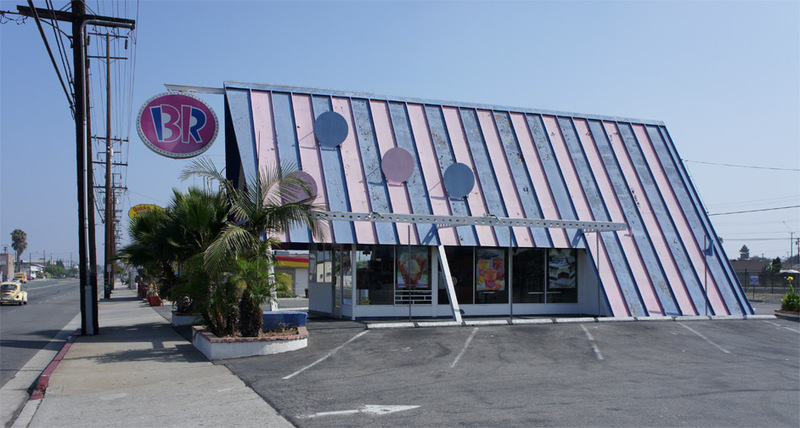 This improbably well preserved Baskin-Robbins ice cream stand at 13424 Crenshaw Boulevard in Gardena is one of the few remaining outlets of what was once a common type. Constructed as a true A-frame, the store’s roof functions as a billboard, conspicuous from a distance. 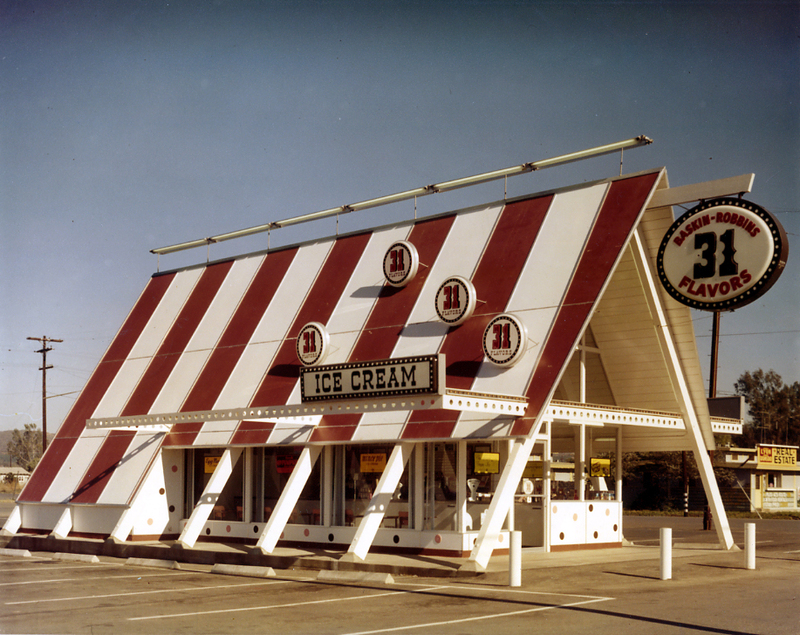 The standing-seam metal roof is painted in alternating sherbet stripes of peeling pink and purple, but at one time would have been ice-cream chocolate and vanilla. Other jaunty elements include four randomly located disks, the raked front of the A-frame, and horizontal steel members pierced with web-lightening holes. 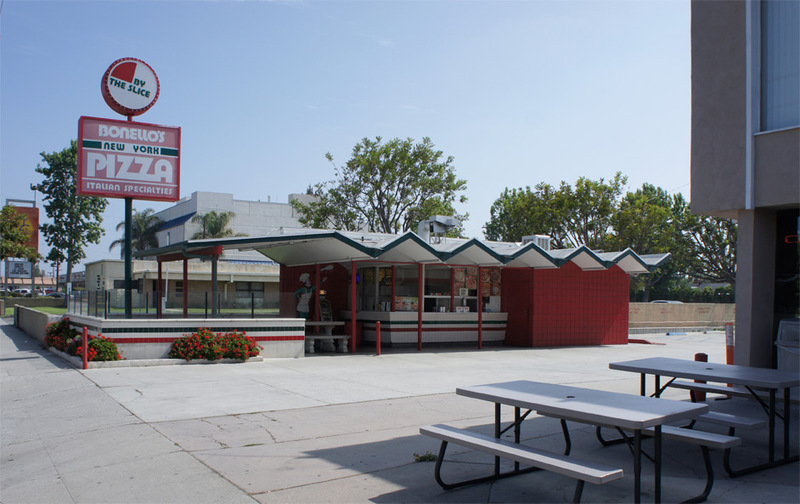 Down the road at 16006 Crenshaw Boulevard stands Bonello’s Pizza, featuring the trademark zig-zag roof of a former Orange Julius stand. 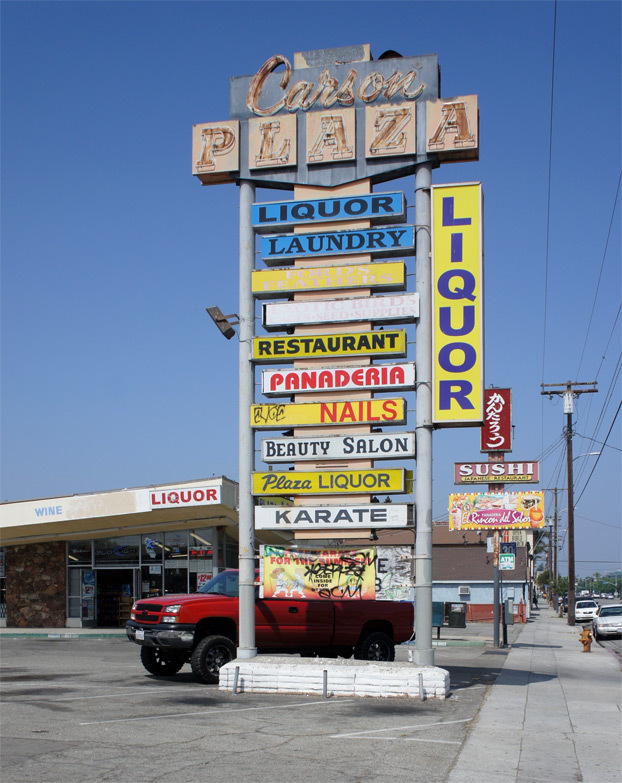 My first destination was Carson Plaza, a modest, mid-block strip mall with particularly high-quality Googie styling and execution. 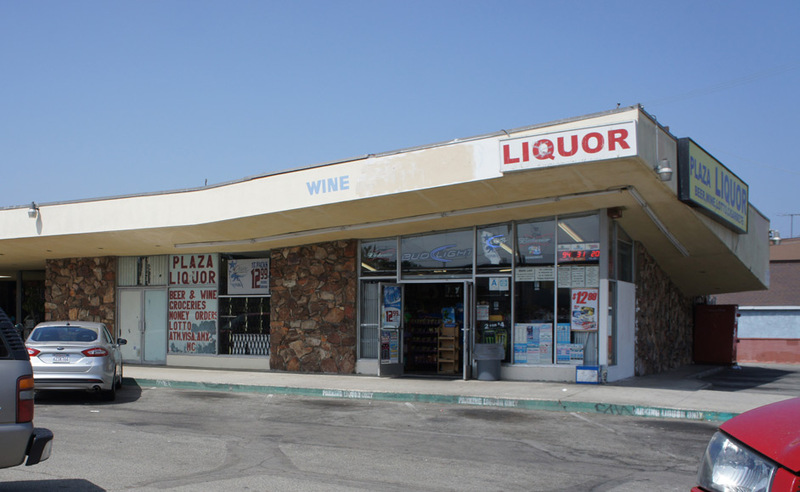 The place looks well broken-in, but I am sorry to say I visited a little too late, as they had already removed the weathered rooftop “PLAZA” sign above the liquor store faintly visible in Google’s bird’s-eye photos, and replaced old signs with newer ones using the Arial font. The sign is a major eyecatcher, tall like Las Vegas, with neon and peeling paint at the top and ten horizontal lightboxes jauntily staggered left and right. The first and ninth of the ten signs advertise “liquor” as well as an additional sign clamped on to the side. 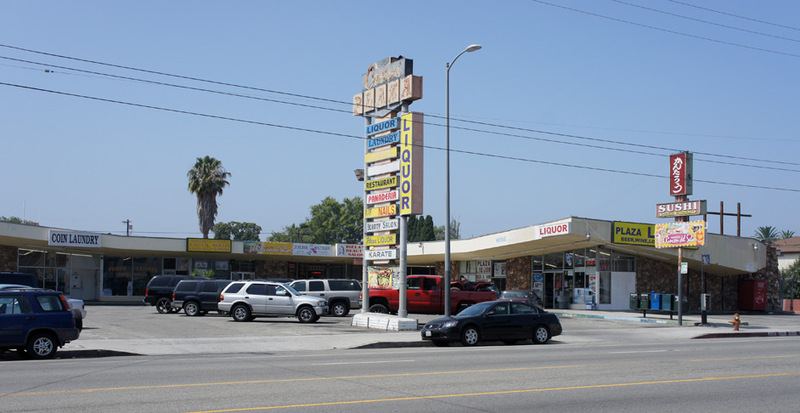 This plaza is anchored by Plaza Liquors, truly one of the Los Angeles area’s great, unsung liquor store destinations. The store occupies the prominent front of CarsonPlaza and faithfully adheres to the classical Googie format. The tapered roof form slopes upward toward the entrance and cantilevers out over a base alternatingly open (aluminum storefront) and solid (heavy-looking walls faced in unpainted rock). The prominence and rough texture of the rock evokes the Flintstones. The tapered roof element, well proportioned to the size of the building and finished in stucco, cantilevers sideways out toward the street as well, visually emphasizing the distinctness of the roof element from the walls that support it and fictively suggestive of a structural rationale for the tapering profile. What sets CarsonPlaza apart is the fact that it takes a basic idea in section and turns the corner with it. The more conventional Modernist move would be to distinguish the front leg of the “L” from the back leg via different roof heights and expression, but here the extruded expression of the roof simply sweeps around the corner. This symmetrical relationship is emphasized by the subtle kinks in the roofline that kick up slightly at each end. CarsonPlaza could have been nothing more than two stucco boxes, but smart detailing lend it the expression of three-dimensional shape. A couple of blocks further down Carson Street stands the festive Circus Do-nuts shop. 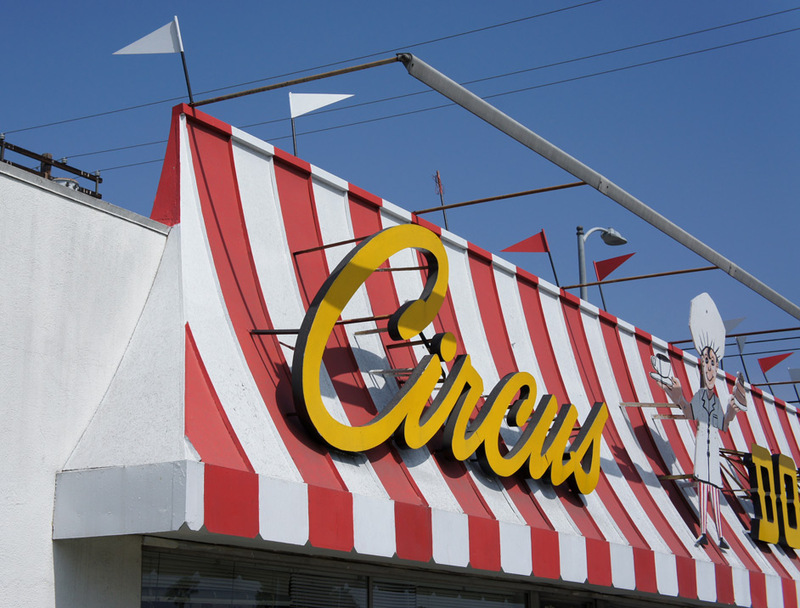 A cheerful variant of the often sedate Gourmet Mansardic style, the massing of Circus Do-nuts has a false mansard screen offset over an otherwise rectangular base, similar in conception to the Washington Boulevard Foster’s Freeze. Strongly graphic, this mansardic device functions as a billboard, with continuous lighting integrated into the assembly, billboard-style. 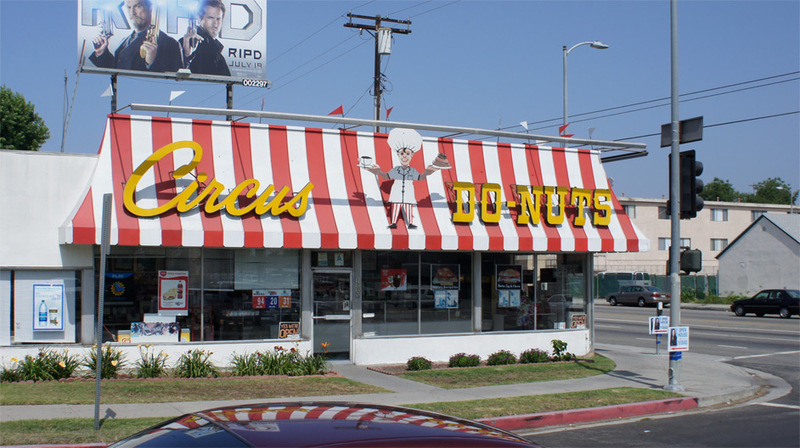 The giant yellow logo signs contrast with their background, and the script of “Circus” contrasts with the Wild-West slab serif of “DO-NUTS.” One is obliged to pause when reading these signs – it is not “Circus Do-nuts,” but rather “Circus… DO-NUTS,” with a seven-foot-tall cartoon pastry chef functioning as the ellipsis. Stiff triangular metal pennants in two colors poke out of the top, contributing to the sense of playfulness; indifferent to the breeze, they all point in different directions. Adhering to the abstract rulebook for how to make things jaunty, their tiny flagpoles are deliberately leaned back rather than vertical. In contrast with the typical mansardic device, this one has a curved surface, is striped in red and white, and folded down at its eaves, all in homage to the platonic circus tent. The typical Gourmet Mansardic logic tries to impart a sense of urbane sophistication to a cheap building, and it is common to see a mansard cheaply constructed of wood with battens in imitation of a more permanent and expensive standing-seam metal surface. Here this logic is inverted, with a more permanent metal standing-seam assembly imitating the fabric of a tent; this is Mansard turned into Funsard. Donuts are simply more fun at Circus Do-Nuts.